But just how committed is Cloudflare to free speech? On August 16, 2017 Cloudflare terminated service to the neo-Nazi website the Daily Stormer after it posted a story celebrating the death of an anti-fascist protester in Charlottesville, Virginia. Cloudflare CEO Matthew Prince stated in a company blog that the final decision to remove the neo-Nazi site was taken not because it had clearly violated any particular policy, but simply because the Daily Stormer “made the claim that we [Cloudflare] were secretly supporters of their ideology.” Evidently, the Daily Stormer was removed because Matthew Prince was personally slighted at the Daily Stormer’s (false) claim that it was ideologically aligned with Cloudflare, confirming how arbitrary and capricious Cloudflare’s removal policies really are. But Cloudflare did not set a “dangerous precedent” by acting against the Daily Stormer. Companies make these kinds of decisions all the time. For instance, video streaming platforms determine whether or not they will allow beheading videos, and blogging services decide on whether they will allow terrorists to use their sites to issue calls for violence. If a company refuses to do business with a group or individual because of safety concerns, the potential customer or user can go somewhere else – hopefully somewhere much less accessible. 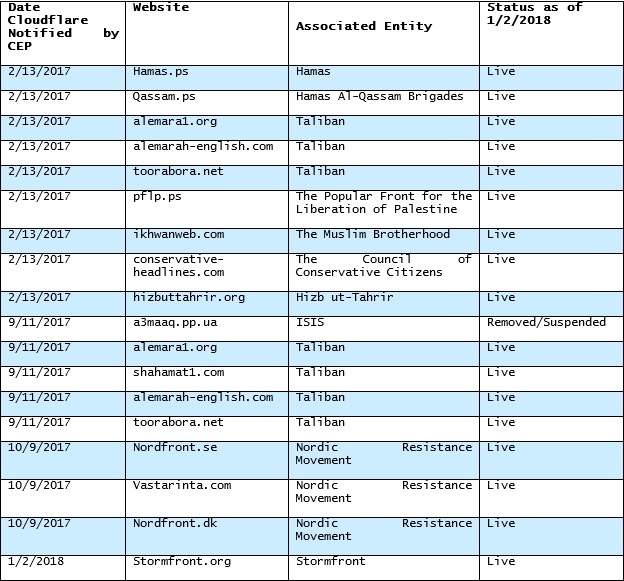 So, Prince’s suggestion that terminating a relationship with a group of extremists means Cloudflare is automatically obliged to do likewise for other groups that might publish “unpopular” content is misleading. Ultimately, it’s not a question of whether certain speech should be allowed or not, it’s about whether a company will or will not provide services to extremist and/or internationally-designated terrorist groups and individuals.